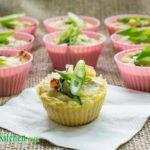 This Cheese, Bacon & Egg Keto Breakfast Muffin recipe is very easy to cook. They make are a great breakfast, lunch or snack food. Not only low-carb but also Gluten Free! Line a standard muffin tin with silicone cupcake molds. Place the diced bacon in a non-stick frying pan over medium heat and sauté for 8 minutes. Turn off the heat, then add the scallions and stir through. Allow to cool for 5 minutes. While the bacon is cooling, crack the eggs into a bowl with the salt and pepper and use a stick blender to mix well. Using a blender helps to break down the egg and make it easier to pour and, without the extra air added by whisking the muffins don't become overly airy. Pour 2 tablespoons of the egg into each cupcake mold. Evenly split the bacon and scallions between the cupcake molds. Pour the remaining egg mixture into each cupcake mold and top each egg muffin with a tablespoon of cheese. Bake for 10 minutes, and remove from the oven as soon as they are cooked through. Remove from the oven and enjoy immediately or store in the fridge. The Egg Muffins can be reheated quickly in the microwave.